Since September of last year, HELP (Argyll & Bute) Ltd have welcomed five new hardworking members to its team thanks to the Community Jobs Fund. These new additions collectively make up our Community Taskforce, coordinated by Jim Moir. This fantastic opportunity has brought five young people into employment, giving them a positive platform to focus on their personal development, boost their confidence and self-esteem through their involvement within the local community - all whilst strengthening their transferable skillsets for any future employment. Over the course of the last five months, the Community Taskforce has been working hard across the Cowal peninsula on a number of local community projects. 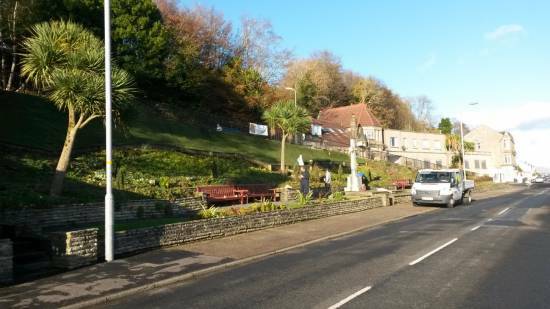 - Regenerating the aesthetic appearance of the Innellan War Memorial with the laying of artificial grass and an extension to existing timber edging. - Soft landscaping of the garden by the Riverside swimming pool, including remedial works to the border fence. - Site clearance on Auchamore Road, adjacent to Cowal Building Supplies. - Painting of DYFL Club House changing rooms. - Continued involvement in the ongoing works at the Glenfinnart walled garden in Ardentinny. - Regeneration of public walkway on Moir Street with the installation of a block paviour path and an accompanying stone feature. - Garden maintenance and clearances for a number of locals referred through the Cowal Elderly Befrienders. HELP (Argyll & Bute) Ltd have been delighted with the positive feedback received within the local community, and now with a number of new projects lined up, there is plenty for the Taskforce and the local community to be excited about.